Our team uses API method to integrate DiamanteDesk plugins or modules with different content management systems. API stands for Application programming interface, so it is a software-to-software interface that enables different programs to connect and share information between each other. DiamanteDesk API integration serves to create individual customer support systems to all sorts of web portals, on-line stores and blogs. Currently, DiamanteDesk is integrated with Magento, WordPress and PrestaShop content management systems. To connect a content management system and the Client’s CRM, API credentials shall be provided. Log in to DiamanteDesk Admin Panel. On the navigation pane select System > User Management > Users. Users screen opens. Click the required user name from the list to open the user profile. 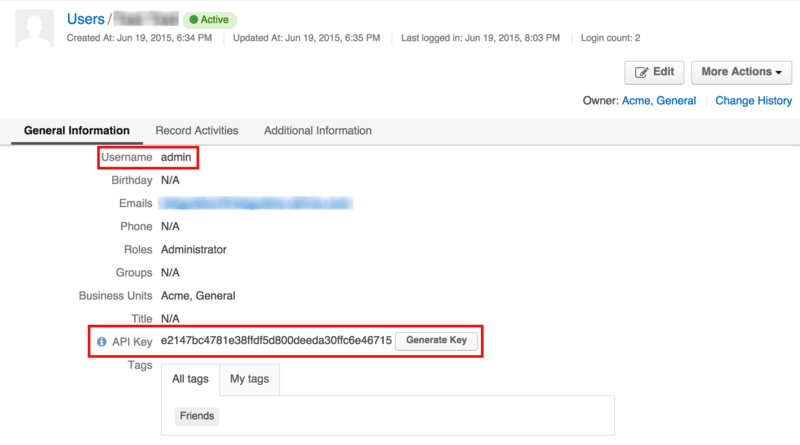 Remember the Username and click Generate Key in the API Key field. Copy the generated API key. Note: API Key can be generated for any user on the profile screen by the user with Edit permissions.